ERDO (ईआरडीओ) DEC Syllabus 2018- Candidates are expected to note that the Education Research and Development Organization of Bihar DEC Recruitment exam Syllabus is given below. You will find attached the detailed ERDO District Education Controller Syllabus and exam Pattern down below. The major subjects of the ERDO Syllabus or the ईआरडीओ डीईसी पाठ्यक्रम 2018 are given below in great detail. Furthermore, we have also given the detailed syllabus topics under each of the given topics. So, we would urge you to carefully curate a timetable which will enable you to prepare for this huge vacancy on your own. The BEC and DEC Portion for the ERDO Recruitment will be the same. So we have given the portion of them together. Whereas, the BTT Study Material and exam pattern differ slightly from the other 2 posts. So, make sure to check out whichever post you would be looking to apply for. 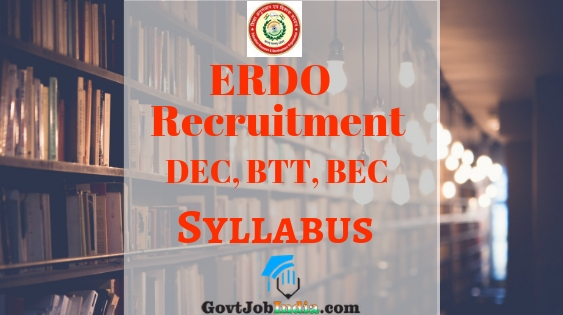 The main prerequisites of preparing for the ERDO Exam are the ERDO DEC Admit Card and the ERDO BTT, DEC Syllabus 2018. Fortunately, we at GovtJobIndia.com have given both. So, before you proceed to the ERDO DEC recruitment syllabus 2018, we have given the ERDO BTT DEC Selection procedure. Are you wondering how to download the ERDO Syllabus onto your laptop or mobile and prepare even when you are offline? We have made a PDF for aspirants who wish to prepare in depth about the ERDO DEC Exam. How to download ERDO BTT, BEC DEC Syllabus and Exam Pattern 2018 in PDF Format? Click on the link given below and download the complete ERDO DEC syllabus pdf with exam pattern by going to the link. Save the name according to your preference. Next up save it to your preferred drive and start preparing for it now! Therefore, in 3 easy steps, you would have downloaded the ERDO DEC Syllabus. You will be able to download the official ERDO DEC syllabus and exam pattern pdf in the link given below and you can save it onto your personal computer and read it whenever you wish like studying. The Test Paper Pattern for the ERDO DEC, BTT exam 2018 is given down below. Candidates can, without any hesitation, refer to this and master the subjects and ace the exam. Questions: Objective Type Multiple Choice Questions. Negative Marks will be there. Maths & Science Questions is only for Science Category. Social & Other is only for Art Category. Question Type: Multiple Choice Questions-Objective Type. Marks: Each Question will carry 1 mark. The ERDO Personal Interview which will be held sometime in the year 2019 has a set list of questions and topics which you need to prepare from. But the list hasn’t been updated yet. So, we at GovtJobIndia.com will give out the personal interview questions soon. The details of the questions asked in the personal interview are not yet disclosed. The topics which will be asked for the personal interview will soon be updated on our page. Bookmark this page for knowing what will come in the ERDO DEC BTT Personal Interview 2018-19. The various certificates which you would require to bring to the document verification centre are listed down below. This is only if you get selected for the first stage of the ERDO DEC Recruitment Exam. Hope you liked this article about ERDO DEC, BTT, BEC Syllabus 2018. If you did, make sure to share it with all your friends who might be appearing for this examination. You will find that this article will greatly benefit everyone you send it to. Also, ERDO DEC Subject Wise Syllabus & Exam Pattern should be prepared thoroughly for passing the ERDO Recruitment Exam 2018. Furthermore, if you are interested in knowing more about the latest govt job notifications, make sure to subscribe to our website for regular email updates.